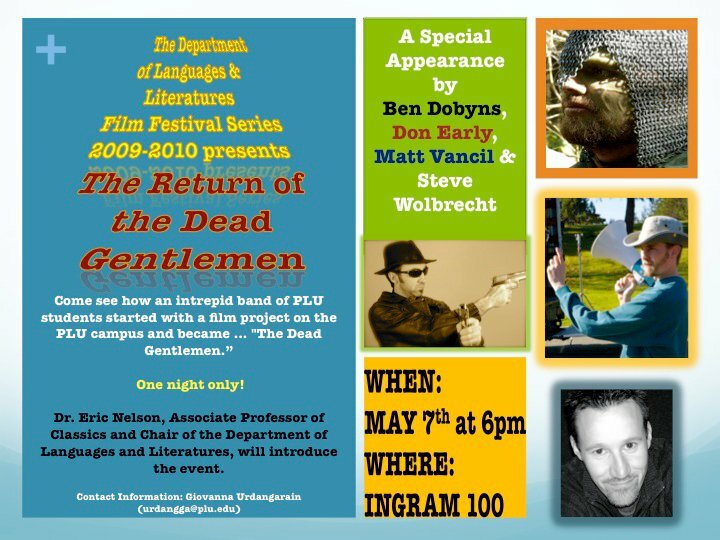 We return to our alma mater, Pacific Lutheran University on Friday, May 7th at 6pm in Ingram 100. That’s right folks, this is where it all began over 10 years ago, with the creation of Demon Hunters. Ben Dobyns, Matt Vancil, Steve Wolbrecht, and Don Early will be talking about how it all began, how PLU has influenced the past 10 years, how the Classics Department influenced our work, and where we are now and what’s to come. We’ll be showing clips from our work, as well as scenes from Matt’s new project JourneyQuest. The event is open to the public and it’s free. A big thanks to Dr. Eric Nelson and Giovanna Urdangarain for inviting us for this event. Incidentally, a little known fact is that Giovanna Urdangarain wrote the Spanish Subtitles for us on The Gamers! Hey, that’s awesome! I was thinking this was earlier in the day… I might be able to stop by!! Damn! I just found out about this, and I’m already going to w00tstock tonight, at the exact same time. Fail!